File Types: JPG,EPS,All Files; File Size: 1.1 MB; Requirements: Adobe CS1+; Vector: Yes. 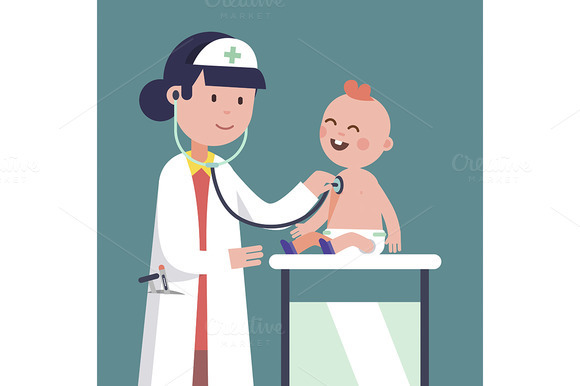 Pediatrician doctor woman doing medical examination of baby boy. Listening to kid heart rate with stethoscope. Modern flat style vector illustration cartoon clipart. Keywords: flat, icon, vector, isolated, illustration, symbol, sign, object, white, template, background, design, cartoon, clipart, character, kid, child, children, small, people, person, childhood, young, infant, play, fun, joyful, joy, cute, youth, smiling, caucasian, cheerful, human, baby, toddler, newborn, suckling, boy, male, man, son, girl, female, woman, daughter, lady, doctor, doc, physician, medic, therapist, pediatrician, paediatrician, visit, exam, examination, clinic, care, specialist, diagnose, nurse, healthcare, health, hospital, treatment, cure, sickness, sick.